Free Jazz. The Avant Garde. I have listened to quite a few free jazz albums, and I can't really define what it is- but maybe that's the point. Yet, when you hear it, it hits you in the face. In some ways, free jazz came about because jazz musicians in the fifties and sixties were dissatisfied with the limitations of conventional forms of jazz. Many forms of free jazz do not have set chord changes, a set form, and some do not have definite time. In this way, without conventional rhythm and harmony, players have to listen and respond quickly to what others play- that's what I like about free jazz. Free jazz, for me, is rebellion. Yet, it is also a lot about democracy, communication, and listening. The molding of the individual within a group- clashes, discords and all. And accepting this kind of sound can take a while. 1. 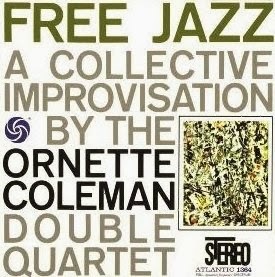 Ornette Coleman "Free Jazz"
This is the first free jazz album I ever listened to. I had heard about this album, so one day in high school I had it on my iPod and put it on play. Now, I know most people do not like this album at first- it is quite jarring. It can sound like only random sounds. Yet, the first thing I did while listening to this album was laugh! I wasn't making fun of the sound, but I was amazed by the freedom. It sent me into jubilation! I didn't know people could play like this or were even allowed to. 2. Albert Ayler "Spiritual Unity"
Now parts of this are really my jam. I love the way Ayler starts it off, with a catchy theme, that just makes you want to dance. His rhythmic sense is impeccable. Then it gets complicated as it progresses and seems to delve deeper and deeper. I enjoy his tone- he captures a sort of big, gruff tone. Ayler said this about the album: "We weren't playing, we were listening to each other"- and I think that kind of almost selflessness to your improvisation is admirable. 3. Eric Dolphy "Out to Lunch!" I absolutely love Eric Dolphy! I love how he can play so many woodwind instruments, and improvise on them all in such a unique way. On this album he plays alto saxophone, bass clarinet, and flute. His style is angular, but also rooted in a lot of conventional bebop and classical language. There is something about Eric Dolphy's playing that just makes me so happy- he is so individual and genuine in everything he plays. John Coltrane's work spanned many periods of jazz- and his later years led to a large influence on free and avant garde forms of jazz. The concept of this album was supposed to sound like a big band- with players receiving a lot of freedom. This album is similar to Ornette Coleman's "Free Jazz" in the way that they are both continuous performances with ensemble parts and individual solo sections. What I like about this album is the soulfulness- John Coltrane was a very spiritual person that constantly strived for personal expression- and I can hear that in the album. 5. Cecil Taylor "Unit Structures"
Cecil Taylor is a very interesting person. His approach to piano is more percussive than melodic or harmonic. His piano playing has been likened to "eighty-eight tuned drums" (for the number or keys on the piano. The way he hits the keys is so full of energy and frenzy. I like this particular album for its high energy and its intensity. The album feels very blocky, like the cover art, but molds together in an abstracted way. The improvisations seem to be based on a general mood set forth, and seen, in the title. I like free and avant garde jazz for its rawness and commitment to group listening. I think it's amazing how people can be so free in their playing. I have taken quite a few lessons from just listening to these musicians- such as embracing discord as equally as embracing harmony. I have learned that sometimes it's not even what you play, but how you play it. And the kind of ferocity these musicians play jazz with is inspiring for me. Leave a comment below saying your favorite free or avant garde jazz musicians and albums!